Mashed Potatoes are a quick and easy-to-make comfort food. It’s one of those foods that I never use a recipe to make. Long ago I learned how to boil the potatoes, whip them, add a little butter and milk, and whip a bit more to combine. Given how easy it is to make Mashed Potatoes, I was very surprised to discover a hundred-year-old recipe for Mashed Potatoes that contained extensive detail. Back then even the most complex recipes were generally short and lacked details, Why would recipes for difficult-to-make foods leave a huge amount of latitude for interpretation, while a recipe for a basic food be very specific? 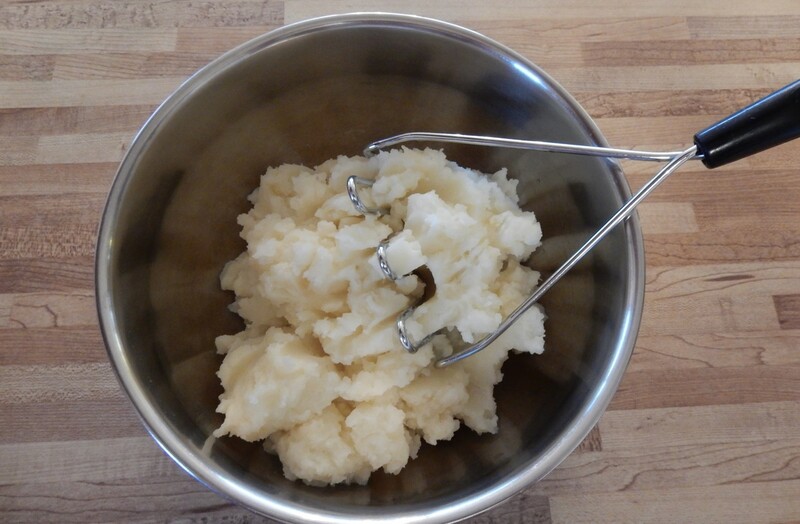 I generally use electric beaters to make “mashed” potatoes, but I decided to give the old-time recipe a try. I dug out my old potato masher out from under all my other seldom-used kitchen utensils in the back of bottom drawer in the kitchen cabinets, and made real mashed potatoes. Put enough water into a large saucepan so that it is about 1/3 filled; add salt and bring to a boil using high heat. Add diced potatoes; return to a boil, then reduce heat and simmer 15-20 minutes or until the potatoes are very soft when poked with a fork. Remove from heat and drain. Using a wire potato masher, mash the potatoes until smooth. Add the butter and half the milk. Mash a little more to combine. If the potatoes are too stiff, add additional milk until the potatoes reach the desired consistency. (Do not over-mash or the potatoes will get gummy.) Reheat the mashed potatoes using medium heat To reheat, put the pan with the mashed potatoes back on the stove using medium heat for 15-30 seconds; stir once or twice. Remove from heat and put in serving dish. Posted on November 20, 2016 November 20, 2016 by SherylPosted in FoodTagged potato, recipe. Now I’m so hungry for mashed potatoes, I may have to give in. I don’t usually have them — I’ll bake sweet potatoes instead — but you’re right that they’re the best comfort food in the world. I’ve long given up the use of a potato masher in favor of the mixer, but I may give that old approach another try. I’d also long given up the use of my potato masher, but it was fun to try it again. I was surprised how easily and efficiently it mashed the potatoes. 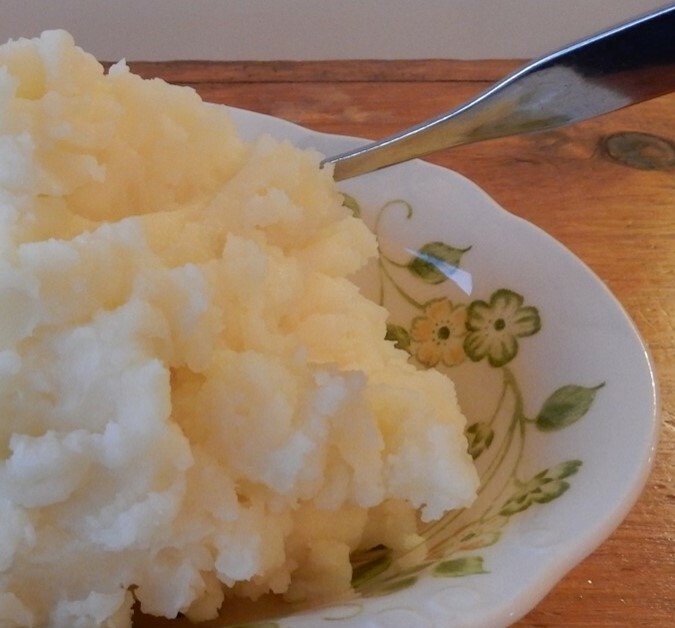 Although I’ve had mashed potatoes all the time, this recipe still brings fond memories! It’s interesting how both common frequently eaten foods, and unique special foods, evoke food memories. I have never heard of “butterine” before. I assume it is a butter substitute. My grandparents used to call margarine “oleo” and explained that it was white and that yellowing coloring had to be mixed in to it in order for it to resemble butter. My mother had similar stories about “oleo.” When she was young people who purchased oleo had to mix yellow coloring into the oleo after it was purchased. I think that it was against the law for companies to sell yellow oleo back then. Even simple things differ between England and America. We usually halve potatoes, unless they’re very large, rather than cube them. And I’m sure every English home has an old-fashioned potato masher: we don’t usually use electric mixers for spuds. But I’m sure all mashed potatoes, yours and ours, taste just as good wherever you live. I think that you’re right. 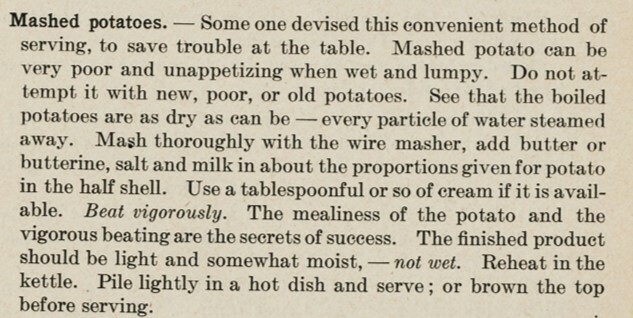 The author probably wanted to be sure that readers could successfully make this common dish. It never really answered why not to rapid boil… I would of loved to hear that answer. 🙂 lol, I have tried to hurry potatoes cooking… makes a mess spitting potato water over the stove ..which if your not watching ,soon gives you a no water in the pan with blacken potato bottoms. A family favorite around here. How true- more often than I’d like to admit, I’ve accidently boiled away all the water on potatoes and ended up with burned potato bottoms. It can happen so quickly. I’ve never made mashed potatoes. I love to eat them, but not the work. I’ll send this to the kids. They are the mashers.Sheila. I’m the potato masher in my family. Your comment makes me wonder if my children have ever made mashed potatoes. Great with a dallop of sour cream mixed in. mmm. . . sour cream would be a nice addition. I may be one of the few people who don’t care for mashed potatoes…but mashed sweet potatoes on the other hand – yum! mmm. . . mashed sweet potatoes sounds good. That was very specific! My mother also insists on the importance of drying the potatoes completely before mashing, and I’ve since heard that heating the milk to room temperature before adding makes them creamier. I love all mashed potatoes, but I admit I’m not against trying any procedure that makes them even better! My daughter said that when she had a home economics class in middle school that the teacher also stressed the importance of steaming excess water off the cooked potatoes. Did you notice any real difference in taste, texture, etc., when you followed the old recipe? It really is so specific! Not much – It’s pretty similar to what I normally do, except I usually use my electric beaters instead of the wire masher. I think that the hand-mashed potatoes probably weren’t quite as smooth as whipped potatoes, but there really wasn’t much difference. Mashed potatoes usually get mashed with a fork at my place! Our potatoes are sold as boilers, salad, bakers, mashers etc. If I buy the mashing potatoes I get better results than if I mash the other kinds. I wonder what varieties were common a hundred years ago.